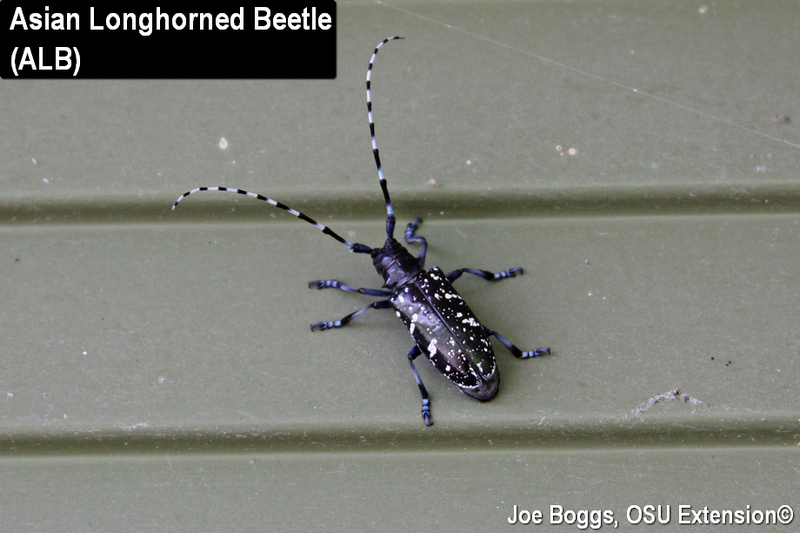 Asian Longhorned Beetle (ALB) (Anoplophora glabripennis) is potentially the most devastating non-native pest to have ever arrived in North America. The beetle kills trees belonging to 12 genera in 9 plant families. This includes all maples (Acer spp.) which are highly preferred hosts. Successful eradication is essential to avoiding a catastrophic loss of trees on a scale never before seen in the U.S. The Ohio Department of Agriculture (ODA) in collaboration with the USDA, Animal and Plant Health Inspection Service (APHIS) announced on Wednesday that Monroe Township in Clermont County, Ohio, is now free from ALB. It's a significant "win" for the earnest professionals dedicated to protecting us from this pernicious pest. It's also the second ALB infestation that has been eradicated in Ohio. Thus far, every ALB infestation in North America originated directly from Asia. So-called satellite infestations have occurred when infested material has been unwittingly moved before the original infestation is discovered. The beetle was first detected in Ohio near Bethel in Tate Township, Clermont County, in June 2011. The Monroe Township satellite infestation was found later that year in September and another satellite infestation was detected in Stone Lick Township in 2012. ALB was found in East Fork State Park and portions of the East Fork Wildlife Area in 2016; however, those infestations are contiguous with the Tate Township population. The Stonelick Township infestation was declared to be eradicated earlier this year in March and the ALB quarantine was lifted (see BYGL Alert, March 16, 2018). Work continues on closing down the Tate Township / East Fork State Park / East Fork Wildlife Area ALB infestation and these areas remain under quarantine. In my opinion, there are many unsung heroes in the ALB saga. These are the dedicated individuals who work for our ODA and the USDA APHIS under the umbrella of the ALB Cooperative Eradication Program in Ohio. Their work is essential to our well-being and we owe them our support and gratitude. Early detection is critical to the successful eradication of ALB both in terms of time and money. This means we must remain vigilant no matter where we live in Ohio or elsewhere in the U.S.
Never believe ALB is "somewhere else." Prior to 2011, I was completely unaware that ALB was living just 25 miles from my home in southwest Ohio. ALB can pop-up anywhere, even in our own backyards. 1. Host: Focus on Maples. ALB will attack trees belonging to 12 genera; however, maples (Acer spp.) are by far the most preferred host. If ALB is in an area, they will find the maples. 2. Branch Breakage. ALB larvae tunnel through and feed on the wood (xylem) of trees. This weakens branches causing them to break. Unusually heavy branch breakage on living maple trees should be investigated! 3. Holes: The "Pencil Test." The big beetles typically emerge from deep inside the wood of a tree (xylem), so the round adult emergence holes extend deep into the tree. Inserting a #2 pencil into the holes will reveal the depth of the emergence holes. However, trees may eventually close the exit holes with callus tissue. 4. Pits in the Bark. ALB females chew a concave pit through the bark to the xylem where they lay a single egg. The "oviposition pits" may weep sap during the season. However, trees usually close the pits relatively quickly, so you may only see rounded wounds. 5. Woodpecker Damage. ALB larvae live deep inside the xylem of live trunks and branches of infested trees. Woodpeckers excavate deep holes in search of these large tasty meat morsels. Seeing heavy, deep woodpecker holes on live maple branches should be reported. 6. Frass: Small Wood Shavings. ALB produces small wood shavings as they emerge from trees or as the females chew oviposition pits. 7. Bark Cracking. Larval feeding damage may stimulate trees to produce callus tissue beneath the bark. The expanding callus tissue lifts the overlaying bark producing cracks and fissures. 8. Big Beetles. ALB is a very large beetle. We are at the end of the "beetle season" in Ohio. However, some beetles may still be found wandering about. If you find any of these ALB indicators that I've listed above, report it! Give the ALB professionals a chance to investigate. In fact, if you find ANY suspicious signs or symptoms, report it! There is no harm if it turns out not to be ALB but there's great harm if it is ALB and it's not reported. You can report by phone by calling 1-866-702-9938, or 513-381-7180. You can also report online by clicking the hotlink under "More Information" below.